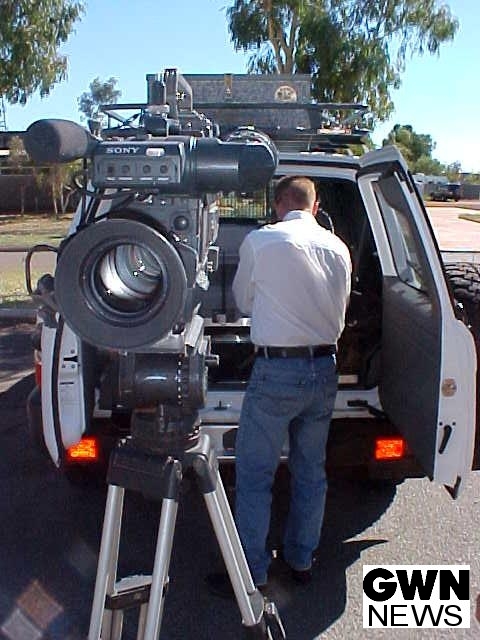 Yesterday, when I got in contact with the district police and amazed them with my sudden presence in their life, Geoff Reynolds, my current host, called a friend who worked at the newsroom of GWN, the regional television station. 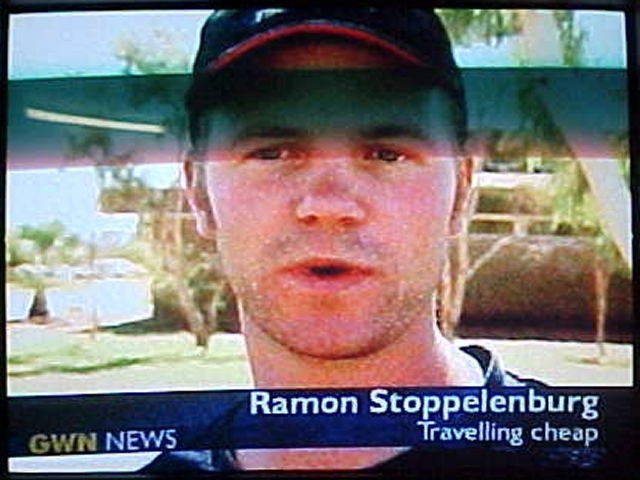 And yes, within one day, I was on Australian television again! Geoff took me along to his office in Karratha, where I was introduced to many other officers with lots of pride. He first had let me sleep me in at his house and took along my laptop, because another virus had been blocking the system again (sigh), to a computer guy he knew in town. 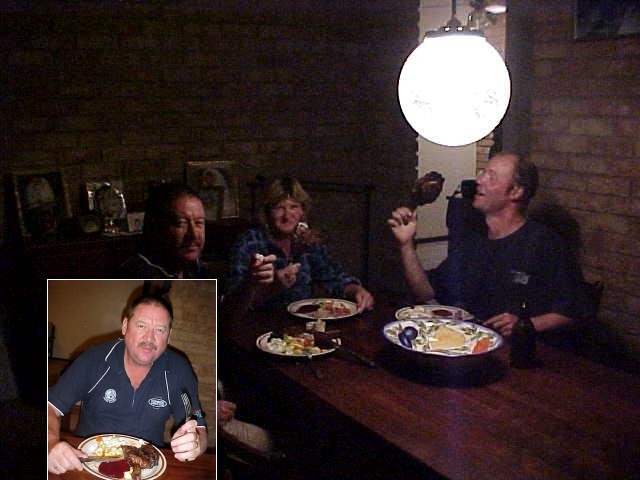 He'd take some time off and wanted to show me around in Karratha and the next-door town Dampier. I saw the towns from lookout, saw the white salt farm lakes in between and was amazed by the amounts of rocks in Dampier. The entire town is built on loose rocks, they only added sand and built their constructions on it. 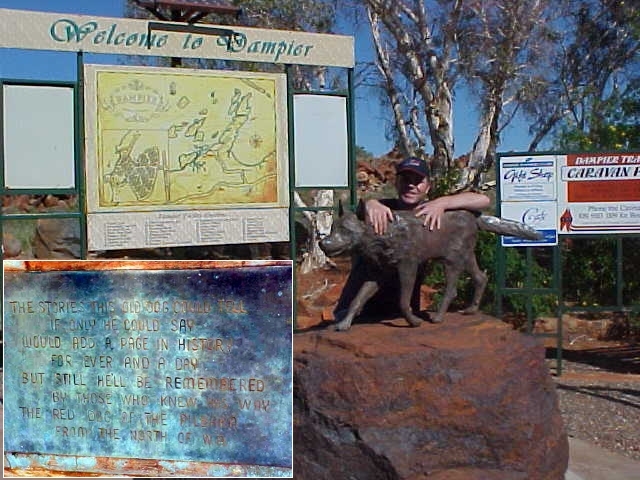 I still don't get it why they called that place Dampier, as it should better be called Wilmatown or Barneyville, named after characters in the Flintstones! They are rocky too! When we got back at the police station after noon, I met up with the reporter James from GWN News. Geoff contacted him yesterday and told him he might have an interesting story for the news. James was interested in doing a short story about me for tonight's regional news (seen throughout almost the entire State). Next to superintendent Ron Carey, I was interviewed about how I ended up in Karratha and about how the police had helped me out with a ride. Ron Carey sent out a very positive message about the police district and its serving the people. After the news report recordings outside the police office, Geoff took me along to the Retravision computer store in town, where computer guy Ben (a real experienced one!) was happy to meet me and he had my laptop fixed in a blink of an eye. He helped me with the latest anti-virus software. He loved my project as he had seen about my website in different media. "Where are you heading next?" Ben asked me. "Well, I am just going off towards Perth I guess." And suddenly everything went very fast; he dialled a number on his phone and told the person on the other side about me and my need for some help to Perth. When he hung up he told me: "My girlfriend works at Travelworld, just around the corner in the mall. She will be your sponsor for a flight to Perth on Monday." As unbelievable as that conversation occurred, that unbelievable I was when Ben's girlfriend Josie Wright handed me this free plane ticket at the office of Travelworld, just a couple of hours later! This way I didn't have to hitchhike anymore, I'd be flying with wings!